The ancestors of Gao Kegong (style name Yanjing, sobriquet Fangshan) came from Western Asia, and Gao rose to Minister of Justice in the Yuan dynasty under the Mongols. He also served in office in the Jiangnan area and resided in Hangzhou, having the opportunity to appreciate scenic wonders of the south and to maintain close relations with scholars there. 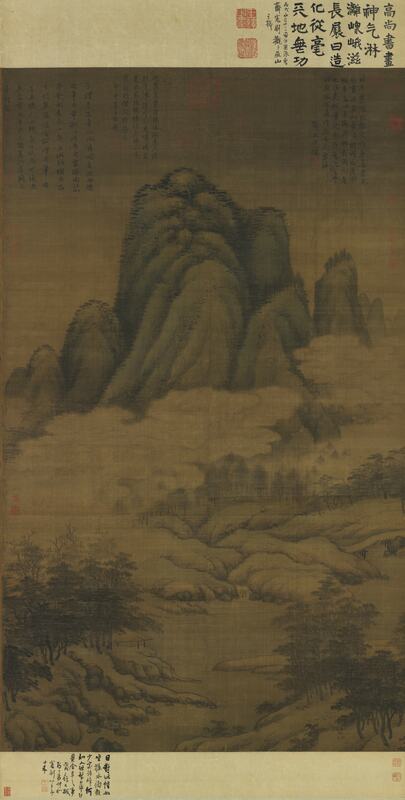 This painting depicts a massive mountain rising in the center, much in the monumental style of Northern Song landscape painting. A winding stream, floating clouds, and rounded peaks with extending banks below give the effect of gentle scenery in the south portrayed more than two centuries earlier by Mi Fu and his son Mi Youren. The painting therefore has characteristics of both northern and southern traditions of landscape painting. Furthermore, the classical archaic blue-and-green coloring adds a vibrant touch of life to the brush and ink. The scroll as a whole reflects the archaistic movement in early Yuan dynasty art, the style a synthesis of various important traditions in Chinese painting history to make this a classical landscape paradigm of Gao Kegong.